As a new & proud owner of the bean bag, I would like to share how one great brand MADE my room more homey. A few weeks ago managed to find a great deal for an oversized bean bag with an Union Jack pattern! The MUST have of the year or what?! Made a home your kingdom! My incredible throne short after arrival. Couldn’t decide on the colour at first but the Piggy Bag in a Union Jack was an ultimate winner! Was looking for the bean bag for a while now & then I spotted a great deal on MADE.com, combined with a £10 voucher from the newsletter subscribing it costed me around 50 quid! More than fair to say it was the best deal on the market for the designer, high quality product. A price of a dinner or a few Friday drinks in London! Ohh yee! Subscribe to the newsletter & get the latest deals + £10 voucher off your first order (provide your email address via pop-up window or in the dedicated section in the footer of their web). Have to say I was surprised by the size as I overlooked “oversized” reference in all that excitement HAHA, but now I’m glad – it is like a sofa & armchair in one! I love my super comfy giant bag! Made from a colourful durable & water resistant material it’s great for indoors & outdoors. Moulds to fit your body shape for genuine comfort. Makes a great occasional seating for me & my guests but most of all its very stylish & amazing addition to any interior – like a good painting (Union Jack pattern is just timeless). Promo code N6FH7IKI – £15 off your first MADE.com order. With inviting friends you can get even more a £15 discount voucher every time a friend places a first order. Your friend will also get £15 off with the voucher code you give them. So its a Win-Win. As it is with all designer stuff they are pricey (and totally worth it :p). But like with all brands a bit of browsing & fishing will guarantee a great deals & discounts. 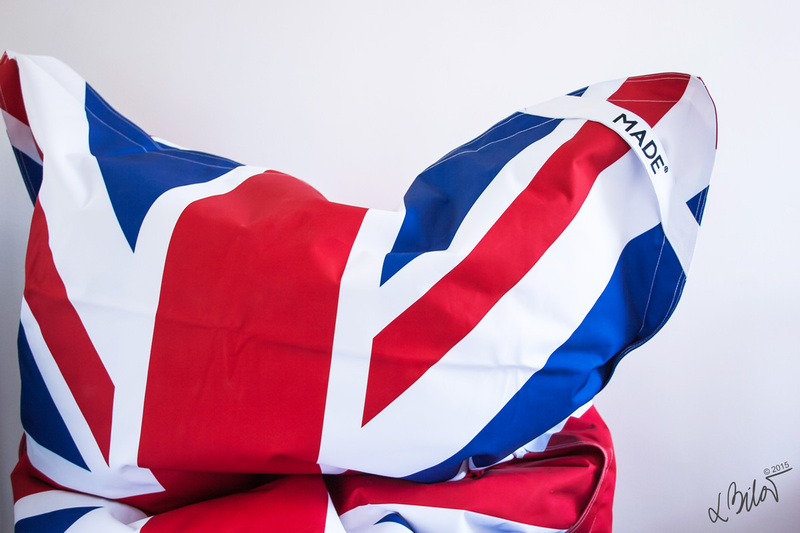 MADE.com is an online designer furniture retailer based in London, England that sells furniture. The company was co-founded by Ning Li and Brent Hoberman, together with Julien Callède and Chloe Macintosh.